Some linguists spend their lifetime on the topic of dialects and language classifications. Then we get the Chinese dialect continuum. Ooh boy. Time and time again I find it so hard to explain to people how Chinese dialects are viewed. You get “dialects” such as Min, Hakka, Wu etc, but then you also get dialects such as the Taiwan or Beijing dialect, which are actually variants of Mandarin itself, in accent, slang and vocabulary. What’s the difference? In my undergrad sociolinguistics module the topic of dialects was a heavily debated topic. In the end it came down to the fact what people define as languages or dialects are defined by the people, not linguistic differences. Mutual intelligibility is not always a method of determining if it’s a different language or not. Afrikaans (my mother tongue) is to some extent mutually intelligible with Dutch, from where it developed, but it’s not seen as a dialect. You could then argue geographical proximity is the determiner of language vs dialect (Afrikaans is spoken in South Africa vs Dutch in Netherlands), but it’s not because you get the different dialects such as Mandarin vs Cantonese which are in close geographical proximity. I’m going on a tangent here, but I’d just like to mention that defining what is a dialect and what is a language isn’t that easy. For instance, for political reasons, it would be better for China to portray the different dialects, Wu, Hakka, Min, etc as dialects rather than different languages to promote 和谐. The Min languages split off earlier, but most of the Chinese languages separated before or around AD 1000, which means that they have been evolving separately since then. The last common ancestor of the majority of the Chinese Languages was what we now call Middle Chinese, or Zhonggu Hanyu (中古漢語). Middle Chinese wasn't a single language, but it was a mutually intelligible dialect continuum. Middle Chinese is about the same as late Vulgar Latin spoken in the western end of the Mediterranean just before the emergence of the languages we know today. I quite like the distinction of Chinese dialects as the differences in Romance languages coming from a common ancestor. Generally speaking, the non-Mandarin languages are somewhat more conservative phonetically and are clustered along the southeast coast. Cantonese preserves the Middle Chinese final consonants almost intact, while Gan mostly preserves them but has merged -p & -t, -m & -n. Mandarin has completely lost all Middle Chinese consonants except for -n & -ng, and some dialects have developed a new final consonant -r.
Nifty! Some linguistic nerdyness going on there, but it’s interesting to note at least. The question of whether the various varieties of Chinese should be called dialects or languages in their own right is contentious. There are two principal uses of the word dialect. 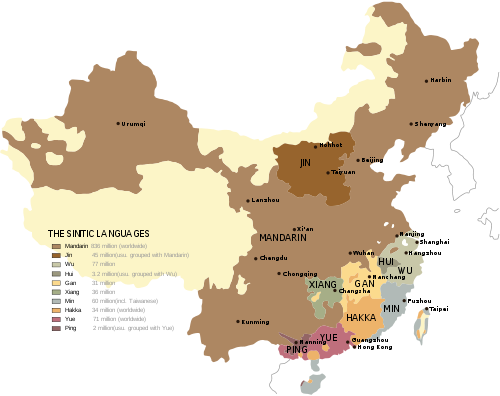 If varieties are considered dialects of a single language when they are mutually intelligible, and separate languages otherwise, then the principal branches of Chinese, and even some of the subbranches, are distinct languages. If, on the other hand, 'dialect' is used in its other meaning of a variety that is socially subordinate to a standardized or otherwise prestigious variety, perhaps one that shares a common written language and literature with the prestige form, then they are all dialects of a single Chinese language, though Cantonese and to a lesser extent Shanghainese and Taiwanese are local prestige forms with use in the media and a nascent literature. In the end it’s hard to really say how you define it. No, I can't. They share some similarities though. Think of it as the difference in Romance languages, such as Spanish and French. They all came from a single ancestor. I would be able to read some signs and texts, but would not be able to speak or understand it when spoken. Have you ever had to answer this question? What’s your answer? Also, who have delved into other varieties of Chinese? Cantonese and Wu (Shanghainese) are some obvious choices. I’m curious! In the future, after mastering Mandarin of course, I might consider trying some other dialects.